Al Gore, Bloviating Blowhard + New World Order Coin + Mandatory Flu Shots; Yes Virginia, The New World Order Gang is REAL! There is so much news to cover, I can scarce keep up with it all, let alone decide which stories to publish. First-up, we have the disgusting, corpulent, psychopathic hoaxster Al Gore publicly lauding how the “cap and trade” bill passed by the house will help bring in “GLOBAL GOVERNANCE!” That’s right boys and girls, the criminals are now so bold, they don’t even pretend to hide their real goals. Ulterior motives have become obvious motives! 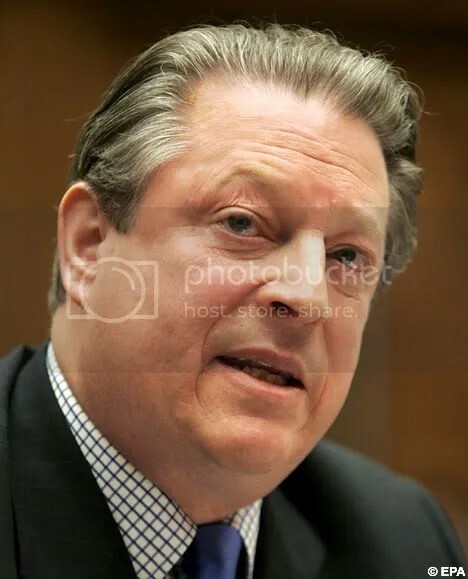 Al Gore is a high level minion of the “New World Order” gang. He may be fat, but he is not stupid. His job is to help bring about new carbon taxes and he works very hard at his job. While extremely wealthy and influential, like Henry Kissinger or Donald Rumsfeld, he serves higher masters and helps to implement the agenda they want to see happen. Al Gore, like his Senator father before him, receives substantial financial support from one of the worst corporate polluters in the world: Occidental Petroleum. YES – “Mr. Global Warming” has stock in an oil company! 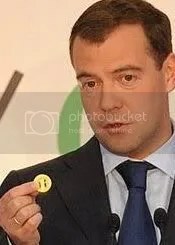 This week-end we see pictures of Russian President Dmitry Medvedev presenting a mock-up “worldwide coin” to the press. China is correct in their analysis. The US dollar, thanks to the hard work of the Bush/Paulson/Obama/Geithner/Greenspan/Bernanke branch of the gang *is* rapidly becoming more worthless than toilet paper, but the US dollar is all Americans have left. We don’t make ANYTHING except fat people and mindless TV shows. Take away the dollar’s reserve currency status and watch how fast we devolve into a third world cesspit. It won’t be pretty. Think all this is by accident? To help “cull the herd” of excessive rabble, the New World Government will simply spray the air with tasty toxic chemicals to make the people passive, sick or dead. Of course, the argument will be it is to “Protect the Earth from Global Warming” bwah ha ha hah ha ha. Also ever more present in the news, we have the constant hum of warnings and predictions of a massive swine flu pandemic. This “swine flu” is about as naturally occuring as Chicken McNuggets. It is completely manufactured and it is another weapon of terror and control. You *do* realize that your loving Government ALREADY has passed “Executive Orders” saying they can forcibly inject you in the event of a pandemic….right? But I am sure the vaccine is absolutely safe and has nothing bad in it. Because the Government LOVES US! Yes, they even fluoridate 66% of our municipal water supplies so we can all have shiny white teeth! (I grew up in a town with fluoridated water; I never once remember getting a free Government toothbrush, or a voucher for a dentist visit, but by golly they gave me “free” fluoridated water!) Check out my “Fluoride” category for more information on this wonderful gift from our Government. Just breathe in the chemtrailed air, drink the fluoridated water, roll-up your sleeves for their vaccinations, pay your carbon taxes and watch TV. Al Gore is right. Humans are warming up the planet. He is going to help stop that. Bad humans! Bad! Every single statement in this ten minute video is a historical FACT. Watch this video and share it with your friends. You will witness what we as a nation have endured at the hands of the bankers. Their tyranny continues. What is covered in this short, powerful film is not conspiracy theory. It is historical fact. Recognize the lies and thievery that are ongoing. Bush, Obama, Paulson, Geithner, etc. ALL THIEVES AND CRIMINALS SERVING THE GLOBALIST BANKERS! Are you better off today than your parents? Will your children be better off than you? Why does it take two working adults to raise a family nowadays? Why are you working more but steadily losing purchasing power? Why do Wall Street Banks get a “bailout” but GM is allowed to go bankrupt? These things did not happen by accident my friends. Knowledge is Power. Get some knowledge. Follow the money trail and behold the matrix.